Camshaft alignment tool 1 – No.EN-48383-1. Camshaft alignment tool 2 – No.EN-48383-2. Camshaft alignment tool 3 – No.EN-48383-3. Crankshaft alignment/turning tool – No.EN-48589. Crankshaft pulley holding tool – No.EN-47981. Crankshaft pulley holding tool handle – No.EN-956-1. Crankshaft pulley installer – No.EN-41998-B. Crankshaft pulley removal tool – No.EN-47982. Flywheel/drive plate locking tool – No.EN-46106. Tensioner locking pin – No.EN-46112. Tensioner plunger resetting tool – No.EN-49416. Using crankshaft alignment/turning tool, rotate the crankshaft clockwise to the stage 1 alignment position  . Install camshaft alignment tool 1 to rear of LH camshafts  &  . Ensure LH secondary timing chain coloured chain links aligned with timing mark on each sprocket  ,  &  . Ensure there are 10 chain links located between the timing marks on both camshaft sprockets  &  . 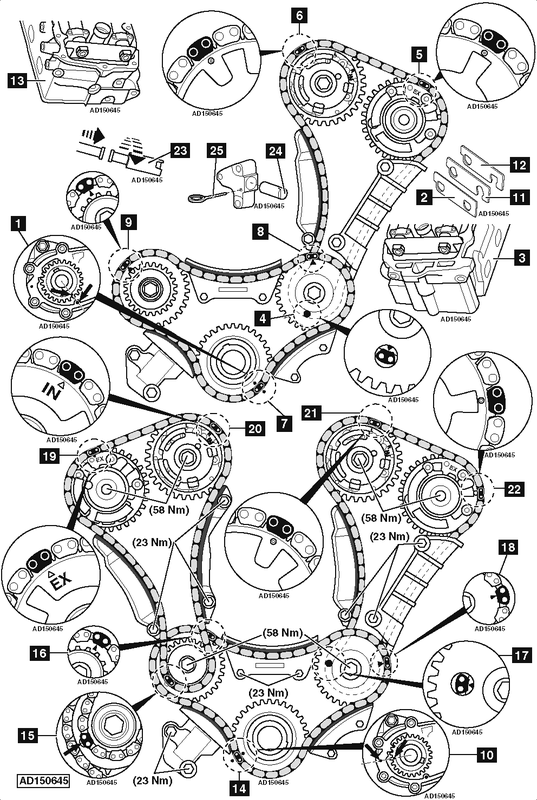 Ensure there are 22 chain links located between the timing marks on both camshaft sprockets  &  . Ensure primary timing chain coloured chain links aligned with timing mark on each sprocket  ,  &  . Remove camshaft alignment tool 1. Using crankshaft alignment/turning tool, rotate the crankshaft 115° clockwise to the stage 2 alignment position  . Install camshaft alignment tool 2 to rear of LH camshafts  &  . Install camshaft alignment tool 3 to rear of RH camshafts  &  . Ensure coloured chain links aligned with timing marks on sprockets  ,  ,  ,  ,  ,  ,  ,  &  . Using tensioner plunger resetting tool, turn tensioner plunger clockwise while pushing inward until locked in position  . Insert tensioner plunger fully into tensioner body  . Insert tensioner locking pin into tensioner body  . Press tensioner rail briefly against tensioner to unlock tensioner plunger.